An important part of any education initiative is integrating it into your work and personal life. 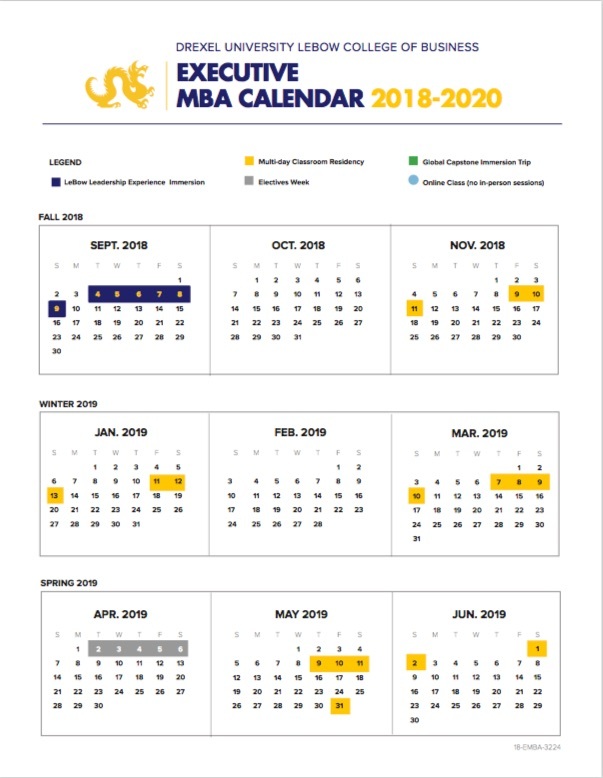 The Drexel EMBA was built from the ground up specifically to streamline the time you’ll be expected to be on campus taking classes - as well as with online studies and reading and preparation time. The calendar here represents the entire seven-quarter calendar - 18 months of study delivered over 20 months (with Decembers off). The EMBA curriculum is built around 19 courses encompassing 22 disciplines presented within seven different types of executive learning experiences - including classroom, online supplemental sessions, residencies, team projects and a global capstone immersion experience - plus elective courses.